How to limit the loss in falling markets through hedging? Due to the unpredictable nature of the markets, hedging strategy can help avoid losses or reduce them in falling market. 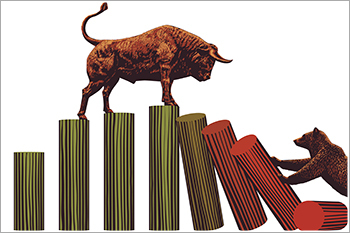 Derivative market is the only market that allows investors/traders to hedge against a fall in the price of shares. As it allows investors/traders to create unique strategies, i.e. SYNTHETIC LONG CALL to take advantage of falling market. What is SYNTHETIC LONG CALL strategy? Strategy: Buy Stock + Buy Put Option. This is a low-risk strategy. This is a strategy which limits the loss in case of fall in markets but the potential profit remains unlimited when the stock price rises. For example, investor/trader purchases a stock (bullish view) and buy a Put option of the stock. The put option will compensate losses against long position in case the market goes down, thus acting as an insurance. Mr. XYZ is bullish about State Bank of India (SBI) stock. He buys SBI future, or in cash at the current market price of Rs274. To protect against fall in the price of SBI, he buys SBI Put option with a strike price of Rs270 (OTM) at a premium of Rs7, expiring on March 28. Please refer to the link for SBI option chain. How much would be the maximum downside if the price falls? Formula: Stock price + Put Premium – Put Strike price. That is, 274+7-270 = 11. The worst that can happen is that the stock would become worthless. Let us suppose, on March 28 expiry, the stock closed at 230, then the loss on the stock is compensated by the gains in put option. Breakeven Point: Put Strike Price + Put Premium + Stock Price – Put Strike Price. What are the factors that need to be analyzed for "SYNTHETIC LONG CALL" strategies? Since the strategy involves being both long and short with an option with the same term and strike. So the things to watch are, implied volatility, delta, time decay and assignment risk i.e merger, takeover, spin-off or special dividend. Due to the unpredictable nature of the market, hedging strategy can help avoid losses, or reduce them, if the market falls. This is a simple strategy to protect deep losses. But it is not easy, as it requires expert skills to analyze implied volatility, delta, time decay and assignment risk. Moreover, practical knowledge in selection of the strike price is also required, as hedging through very deep out of the money has not been rewarding, it has no intrinsic value and loses time value only. So, traders and investors are advised to enter these unique strategies after knowing their risk management through Derivative expert only.